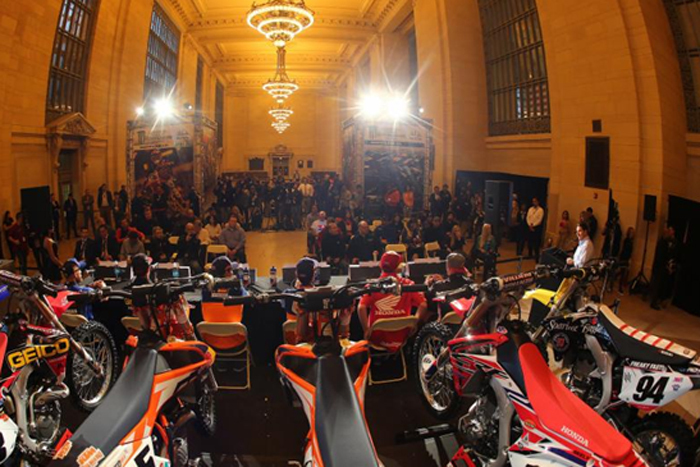 Top riders from both the 450SX and 250SX Classes convened upon the historic Grand Central Station in the heart of Manhattan to kick-off the festivities for the return of Monster Energy AMA Supercross, an FIM World Championship, to MetLife Stadium this Saturday. Red Bull KTM's Ryan Dungey, recently crowned 450SX Class Champion, his teammate Marvin Musquin, GEICO Honda's Eli Tomac, Team Honda HRC's Cole Seely, RCH Soaring Eagle/Jimmy John's/Suzuki Factory Racing's Ken Roczen, and Autotrader.com/Toyota/Yamaha's Weston Peick all took the stage to recap the intense season of racing and the importance of supercross making its broadcast debut of FOX, Saturday at 3:00 p.m. ET / Noon PT. From the start of the season, Dungey was considered a top contender to become #WhosNext on the list of title-contenders, and just two weeks ago he sealed his name in the record books with his second-career 450SX Class championship. 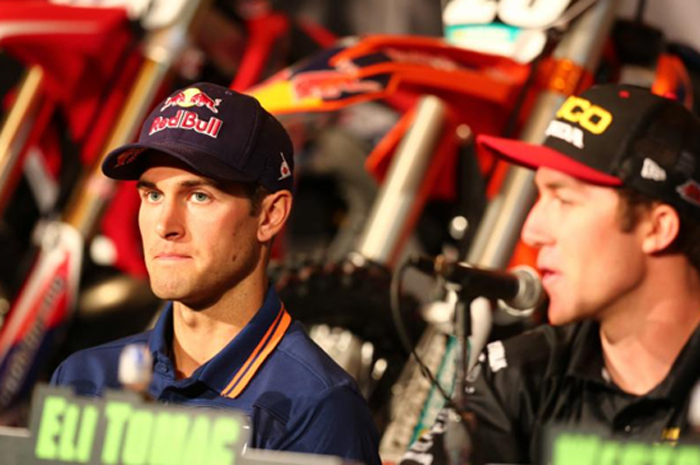 "Being a part of the first ever live broadcast on FOX is really amazing," said Dungey. "Our whole community works hard to give us great opportunities. I think our sport is at an all-time high and only growing, and having a national broadcast is definitely something special. 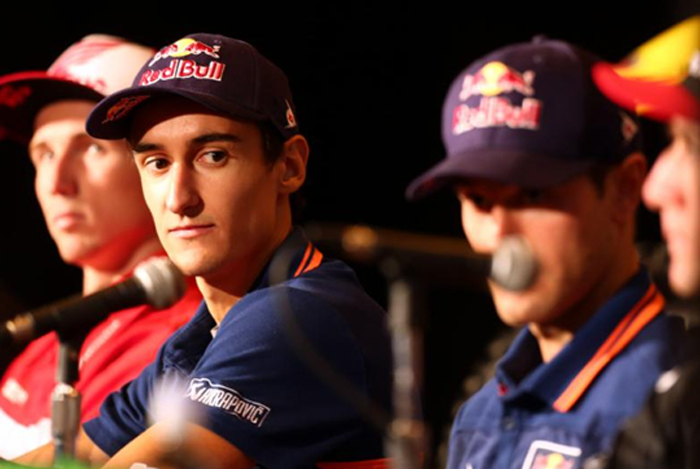 "As racers we are hired to win races and championships and to be able to get through the pressure is a great feeling. KTM has really put a lot into the sport over the past five years and it's great to see it showing this year for both Marvin [Musquin] and myself. Ultimately it's awesome to see the fans supporting our brand, because they are the ones that really allow us to do what we love." Tomac's two wins so far this season haven't told the story of his speed throughout each weekend. He's looking to make the most of the final two races and to Tomac, winning on the big stage with FOX broadcasting nationwide would be a big boost going into the final round. "I think it would be awesome for Honda [to win while being broadcast on FOX]," said Tomac. "As a team we've seen a huge improvement from all three riders in the 450SX Class and to win in this stadium would be cool. As far as my starts, every guy practices starts and thinks they got it when their home. I don't know if it's me or the motorcycle itself, but we'll keep trying and keep at it." With 15 of 17 races completed, Seely is the only rookie this season to grace the top step of the podium with a win in Houston two weeks ago. His rocky start in 2015 was met with a gradual build of confidence and speed, landing him on the podium three additional times this season. "It's a huge opportunity for everyone to be racing live on FOX," said Seely. "I think we'll draw in a lot more fans and if the racing has been as good as it has been all year, it will be a great show. As far as adding another win to the season, that would be huge for me. Getting my first win was pretty special, something that I don't think you really understand it until it happens to you." Peick's overall standing in the championship of 12th doesn't do justice for his breakout season in 2015. After sitting out several races with an injury, Peick has bounced back with a total of eight top-10 finishes, including his first-career podium last weekend in Santa Clara, California. "I've been working really hard as well as the team, and to win on FOX would be incredible," said Peick. "Once I got through the injury, it's been good getting back and finally seeing the results. This week will be interesting with the early schedule, but I know we can make it work." Like his 450SX Class teammate Dungey, Musquin's consistency has put himself in position to capture his first career 250SX Class championship this weekend. He hasn't finished lower than second, and has collected five wins in seven races. "It's an honor to race at MetLife and would be great to close out the season with a win," said Musquin. "This weekend will be a little bit different racing in an open stadium. We've been racing inside for most of the East Coast, but it looks like it's supposed to be nice on Saturday so we're looking forward to a good race. My biggest competitors are Justin Bogle, who is right behind me in the championship, and Jeremy Martin has also won a race. I try not to think about the competition and ride my own race." Roczen made an appearance for the crowd at Grand Central Station and used the platform to provide an update on his injury. "Rehab has been going good," said Roczen. "I'm doing everything I can to be back racing as soon as possible. I've never had an injury like this with ligaments and such, and it's taken a lot longer than I thought it would or liked. So it's just a slow process, but I'm doing everything I can to get back." As a precursor to the historic live network television broadcast on FOX, don't forget to catch all of the pre-race coverage with Supercross Race Day Live presented by AMSOIL, which will stream on SupercrossLive.com from 9:00 a.m. - 12:30 p.m. ET Saturday. Practice, qualifying, behind the scenes features, and key rider interviews will all be highlighted on the Supercross Race Day Live presented by AMSOIL webcast. For more information on the Monster Energy AMA Supercross, an FIM World Championship, please log on to www.SupercrossLive.com, the official website of Monster Energy Supercross. To follow Monster Energy Supercross on Facebook, Twitter and Instagram, log on to www.facebook.com/supercrossLivewww.Twitter.com/supercrossliveand www.instagram.com/supercrosslive. Subscribe to our YouTube Channel at http://www.youtube.com/supercrosslive.